Though anthropology is an academic discipline concerned with studying people, sometimes it must contend with the built environment, and structures that have (or seem to have) a personality of their own. For indeed, as Houston (2008) points out, “built environments become social ‘actors’ in themselves” (139). Some structures seem to be bestowed with certain human characteristics by the communities of which they are a part, becoming concrete, physical manifestations of the nationalist spirit of a people. This spirit is sometimes imagined to have been embodied by a particular, previously living, founder or patriarch, and now memorialized by a constructed monument to that patriarch and the perpetuation of what Anderson (1991) calls the imagined national community. “Imagined because the members of even the smallest nation will never know most of their fellow members, meet them, or even hear of them, yet in the minds of each lives the image of their communion. It is imagined as a community, because, regardless of the actual inequality and exploitation that may prevail in each, the nation is always conceived as a deep, horizontal comradeship” (6-7). I first experienced this phenomenon of built structures embodying the nationalist spirit while teaching English in China, where I was introduced to the cult of Mao, which is most palpable when watching the slowly snaking line outside his mausoleum waiting to be paraded past his remains. I have been confronted with it again since moving to Turkey three months ago. In Turkey, the concept of the Turkish nation is synonymous with one man, Mustafa Kemal Atatürk, the founding father of the Turkish Republic. What he represents for Turkey, and more specifically for the Turkish nationalist project, is embodied in the structure of his mausoleum, Anıtkabir. Atatürk founded the Republic of Turkey on 29 October 1923, and ruled as its first president until his death on 10 November 1938 (Mango 2004). On 10 November 1953, the fifteenth anniversary of his death, Atatürk’s body was moved to Anıtkabir. According to Wilson (2009) the structure was intentionally built as a symbolic representation of Atatürk and the Turkish nation: “Anıtkabir communicated—and continues to communicate—the constructed identity of the Turkish Republic, educating future generations about their past. Anıtkabir, like most monuments, represents and politicizes the past, shaping the memory of Turks and the identity of the Turkish nation” (249). The structure itself does overwhelm one. Imagine, if you will, what it might be like if the symbolism of all the monuments and memorials in Washington, DC could be distilled into one monumental complex, and you will have some idea of the awe-inspiring feeling of Turkish nationalism one is struck by while walking up the lion road (a wide walkway flanked by lion statues in the style of ancient Anatolia) and across the central square of the complex toward the mausoleum. After ascending a set of stairs and walking through an entry flanked by the text of two of Atatürk’s speeches, the symbolic marble tomb of Atatürk can be seen at the end of an empty hall. His actual tomb is one floor below, in a sealed room accessible to the public only via a closed-circuit television in the museum portion of the complex. This actual tomb is fraught with symbolism, as it is encircled by brass vases containing soil from each of the 81 provinces of Turkey (as well as Northern Cyprus and Azerbaijan). “Atatürk is thus literally enveloped by the territory of the nation” (Wilson: 249). Yet, beyond the physical structure and Atatürk’s tomb, Anıtkabir also contributes to the perpetuation of Turkish nationalism through the history told in the museum that is also housed in the complex. In the hall that houses a collection of artwork, a series of monumental paintings depicting the Turkish struggle for independence illustrates this focus on the perpetuation of Turkish nationalism. There are eight paintings in the series, none of which appear to be signed, thereby indicating that the identity of the artist is not significant in comparison to the nationalist story of struggle in wartime and Atatürk’s contributions to that struggle. Included is a depiction of people giving supplies to the war effort, showing, according to the placard next to the painting, the “full participation of the people in the war”. Of course, this begs the question, full participation of which people? It is implied that all residents of Turkey eagerly and happily gave all they had to support the fight for an independent Turkish Republic. Another painting is given the English title, “Selfless Contributions made by Turkish Women in the National Struggle.” A particularly graphic representation of the struggle for independence is “The Massacres Perpetuated in Anatolia During the Invasion Years,” which shows a violent depiction of the Greek invasion of İzmir on 15 May 1919. The final painting in the series is “Turkish Army Entering İzmir After the Great Victory,” depicting Atatürk leading a victorious procession of Turkish soldiers though the city of İzmir. It is situated facing the painting of the invasion of İzmir, heightening the emotional impact of both paintings. Adjacent to the room with these monumental paintings, are two areas that depict major battles in the War of Independence—the Çanakkale Battle, the Sakarya Pitch Battle, and the Great Attack. In these areas, music evocative of an epic war movie is playing, creating a nationalistic “aural space,” as described by Houston (2005), in which even the sounds heard are controlled in such a way as to promote the nationalist project. A large portion of the museum is devoted to the “Vault Galleries.” According the “Hand Guide of Anıtkabir,” which is handed to visitors as they pass though the entrance, there are 18 vault galleries in niches originally designed to house the remains of deceased presidents of the Turkish Republic. Instead, these vault galleries now depict the story of the early years of the Turkish Republic. There is patriotic music playing throughout, to maintain the aural space and help you keep your mind focused on nationalistic awe of early Republican history. At the back of several niches are bronze reliefs, some literally thrusting historical events into your face as you enter. In the niche labeled “Reforms in Education, Language, and History” is included the following note on history reform: “History is one of the fundamental ties that creates a nation. Common history consolidates national unity and cooperation.” This, perhaps perfectly, sums up the nation-building project. The imagining and creation of a homogeneous shared history is central to the promotion of a nationalistic ideal. One also learns in this niche that the Turkish History Research Society was established on 12 April 1931 (renamed the Turkish History Society in 1935), and that Atatürk claimed on 23 August 1931 that, “Writing history is as important as making history. If the writer is not faithful to the maker, the unchangeable truth would have a misleading nature for the mankind [sic].” This, of course, begs the question, what would alternative voices to the dominant Turkish nationalist version of history have to say regarding the rendering of Turkish history presented at Anıtkabir? In the same niche, regarding language reform, we learn that “Language is one of the fundamental ties that constitutes a nation. In a country lacking language unity, the national unity is in jeopardy.” And so, we learn that language reform and making Turkish the sole national language of Turkey were steps to ensuring national unity and strength. However, the Ottoman Empire, the remnants of which were re-imagined into the Turkish Republic, was far from homogeneous, serving as the home to a diverse group of ethnicities, religions, and languages. What of this diversity? It was subordinated in the name of establishing a new Turkish nationalism in the early Republic. A key part of “fostering a new national identity” (Houston 2005:104) was insisting on a single national (Turkish) language. What is conspicuously missing from the narrative presented at Anıtkabir is the presence of alternative voices or perspectives on Turkish history and the transition from the Ottoman Empire to the Turkish Republic. This is, of course, not surprising, given the nature of the nation-building project undertaken in the early years of the Turkish Republic, a project that is continued for contemporary generations in the displays at Anıtkabir. Through a series of sweeping reforms in such areas as education, language, dress, and history, Atatürk strove to create a new Turkish national community and to unify, and in many ways homogenize, the Turkish nation. 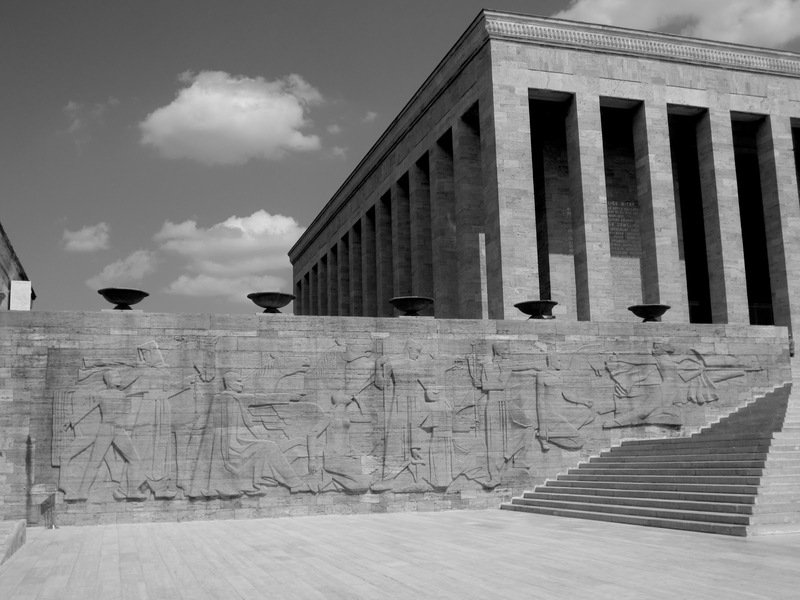 It is the story of this imagined homogenous Turkish nation that is told at Anıtkabir. Anderson, Bendict. 1991. Imagined Communities. Rev. edition. New York: Verso. Command of Anıtkabir. (n.d.). Hand Guide of Anıtkabir. Houston, Christopher. 2005. Provocations of the Built Environment: Animating Cities in Turkey as Kemalist. Political Geography 24:101-119. Houston, Christopher. 2008. Kurdistan: Crafting of National Selves. Bloomington, IN: Indiana University Press. Mango, Andrew. 2004. Atatürk. London, UK: John Murray (Publishers). Wilson, Christopher S. 2009. Representing National Identity and Memory in the Mausoleum of Mustafa Kemal Atatürk. Journal of the Society of Architectural Historians 68(2):224-253.